Quick disclaimer: If you are someone who is completely satisfied with your life then this post is probably not for you. Feel free to click on a different post or go get some ice-cream, have a nap or whatever catches your fancy. For the rest of us, I have a tip that will literally (and I mean that in the truest sense of the word) change everything. Yes…EVERYthing. I’m not kidding or exaggerating even a little. It’s easy. It’s free. You already know how to do it. Best of all, you can do it any time and any where. In fact, I highly recommend that you DO do it all the time and every where. Get on it now, later, tomorrow, and every day, hour, minute and moment you can. It’s quite a simple idea really. Be thankful. Like deeply, emotionally grateful for it all. Engage with a practice of gratitude. Start the day with a grateful mind by just reviewing all the things you are thankful about instead of hitting that snooze alarm one more time and drifting off the sleep. End the day the same way. End it in gratitude. And find every moment you can to practice the mindset of gratitude in between. Stuck at a light? Gratitude. Making another pot of coffee? Gratitude. Frustrated in a meeting? Gratitude. Laughing with friends at lunch? Gratitude. Trip up the stairs? Gratitude. Running late? Or Early? Gratitude. Found five bucks in your coat pocket? Gratitude. Hugs from your kids? Gratitude. Attitude from your kids? Gratitude. You see…there is NOTHING that Gratitude cannot make better. Difficult situations get easier to handle and great times get even better. I could make this list go all day! Life simply gets better. Period. Full Stop. No joke! The only requirement is you and your commitment to it. Did you notice I called it a practice? I mean that…it takes practice and needs to BE practiced and often. Not once or twice…but often. The beautiful thing is (and one that surprises every single person I have coached to do this) how being consistently grateful about our lives ends up bringing soo much more into our lives to be grateful for! You know that what you put your focus on in this life grows right? Imagine…just imagine what happens when you put your focus and energy into feeling really good about everything that is in your life right now. Can you even stretch enough to find that level of vibration? It’s incredible! I promise you. 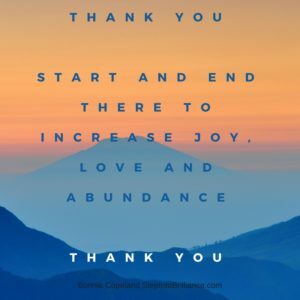 If you want to increase joy, love, abundance or anything else in your life, the fastest and easiest way to begin doing so is with a serious commitment to gratitude. I know it works. I am living proof. This practice truly saved my life after a serious car accident flipped my life upside down, where my belief system was shattered along with my health. It was an incredibly low point for me and this practice was my one and only practice…and life-line. You can try to prove me wrong if you like…go ahead. Don’t worry, I’m not going to say I told you so, I might grin a lot, but no I told you so’s. The more you practice, the better it works – so get to it. Set reminders in your phone, change your password to a phrase to remind you, set automated text reminders, write a list in a journal and read it…easy peasy, but holy cow is it powerful. Look lovely, how do you want to feel? Better, happier, satisfied, authentic, worthy, successful? Lay on the gratitude and watch those yummy feelings grow and grow. Prove it! In the comments below list 5 things that you are super grateful for right now (don’t over think it! ).